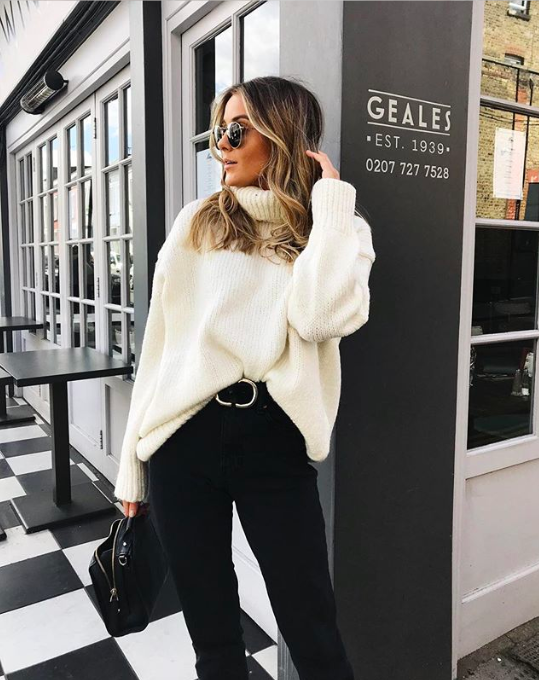 With over 345k followers on Instagram, 42k subscribers on YouTube and her own collection with Pretty Lavish UK she’s one of our favourite fashion bloggers. Forever oozing style and simplicity, the ever-chic Nadia Anya sat down with us to share her story on how she started out. Introduce yourself and tell us how you started. I am Nadia Anya and I’ve been blogging for about a year and a half now. It’s something that I have always wanted to do but never really took the plunge and was always too scared of what others would think. I finally took the plunge and it all worked out perfectly! I’ve been doing this full time for just over a year now and it has been really fun. It’s my dream job but I am still at the very start of it so I hope there is lots more to come. I’m 22 and I’m originally from Scotland but I moved to England at the age of 16. Since then, I have been dotting around the country living in different cities but I am currently based in Winchester. I work from home but I travel up to London 2-4 times a week for work for meetings, shoots and when I have to get content. Did you go to University and what did you study? I went to the University of West England in Bristol and I really wanted to study fashion but ended up studying business and events management which I didn’t enjoy as there wasn’t anything I was interested in but I guess at that age you are kind of thrown into going into University and having to pick a course. At the time, I was just guided by my parents to do something business-related so I did it and got my degree. However if I could go back, I would have done fashion or marketing which would have helped me with what I am doing now! My sister, my boyfriend or my mum. Sometimes my friends and I do afternoon shoots that will give us content to last for a week. It is really just the case of setting up shoots with people in London or with the people I’m with at home. Personally, I am not massively into photography because I don’t think I’m that good I have an eye for what will look good on my feed. You have your own YouTube channel too! How did you start that? YouTube is something I’ve wanted to do for the longest time but I think it’s one of the scariest things to start. It took me a long time to actually get it started. I was so worried that my first video would be really bad, but then I thought at the end of the day, even if I filmed and edited it, no one has to see it but me. After I filmed my first video, I remember thinking to myself, this is actually really good so I ended up uploading it. The more videos you post the better you get and the more natural you become in front of the camera. Do you think it complements your Instagram and building up a following? Tell us about your new collection and collaboration with Pretty Lavish UK. The process has been so fun, I have worked with them for so long. They sent me a piece of clothing way back from when I only had 5,000 followers and our relationship has developed since then. They contacted me a year ago asking if I wanted to release a collection with them and of course I said YES! It has been something I have been nervous about since the start because it is out of my comfort zone but I thought it was an amazing opportunity. I’ve learnt so much from each stage; from the mood boarding, brainstorming to executing on the night of the launch. Do you think one day you would want to launch your own fashion brand? I do 100%. Not a huge brand with thousands of pieces, but definitely a small personal brand with a few collectables. You’ve obviously built a massive platform congratulations! How did this all start? Did you have days where you just wanted to give up and stop? It actually started off with pictures of me in front of the mirror in my University room. I was really consistent and posting every single day for about 6 months. Even if I was sat on my bed writing my dissertation, I would put an outfit on and post it on Instagram. I was tagging, hash-tagging and liking a load of other people’s pictures just to build my engagement, which is basically how it grew. My Instagram used to be of my friends and I and then it just became this page of me. I knew people were talking about me, judging me and laughing at me but I didn’t really care. It affected me a little bit at the start and I felt embarrassed but after I launched my blog I realized that it was all insecurities. There were definitely days where I thought let’s not do it. I am a big believer that we have one shot at life and if we don’t try something now then you are going to look back when you are 80 and regret it. So that motivates me and pushes me on when I get those days of doubt. I absolutely love your style it’s very Scandinavian and minimal. Where do you get your inspiration from and how did you find your style? Mostly from Instagram, Pinterest, the internet and on the street. I have always tried to do my own style so I don’t really follow trends that much. I think the mistake people can make is thinking every trend will suit them and you should follow every trend. I have always had my own minimalistic style and I think having your own style is so key. I have always had my own style since I was a young girl and I have kept true to that through my whole Instagram journey. I love looking at street styles and sometimes I’ll walk past someone dressed really cool and I’ll write their outfit down. I use my iPhone 7+ for Instagram but I have an Olympus PEN for filming my YouTube videos on. I used to use the Olympus PEN for Instagram but I use my iPhone now due to ease. What filter apps do you use? I use Facetune to get the pimples out of my face. I use VSCO Cam for lighting and sometimes I use F2 but bring it down. What advice would you give to people who are late to the scene or don’t even have Instagram, trying to pursue a career in blogging? I think that Instagram is such a massive platform with so many people on it but there is still so much room for others. I think you should be true to yourself and your own style. If you want to do it, you should just do it otherwise you are going to regret it. It might be daunting for the first three pictures but from there on it is like second nature. Go for it and stay consistent and if it is what you want then you will make it happen. For Instagram you should really respond to people that are following you, for example, I sit down for like an hour a day and get back to everyone that has messaged me because then I think it builds a personal relationship with the people that are following you. I try to reply to all my comments and messages. It builds the community and communication of your brand. What was the transition between working and blogging in your spare time? I started getting gifting in University from brands that would send me clothes about once or twice a month. Then I started working a sales job after University whilst getting gifting a lot more and then I think I started charging a small fee around then. I hated the sales job so I applied for a marketing job. I quit my sales job but then the marketing job fell through so I was unemployed. I then applied for so many jobs but only got invited in for 3 interviews, this went on for about 3 months. After about 3 months, my boyfriend pointed out to me that I didn’t need a job and that I was fine with social media. So then after 6 months, I realized that I was making social media my job and that I didn’t need another job since I was already making money from social media at that point. Over time it became my full-time job but my Dad didn’t really understand Instagram and kept telling me to get a job but once he and everyone else around me understood it then I felt more comfortable to have this is as my proper job. What’s the big dream for you as a blogger and businesswoman? The 5-year plan? I definitely want to focus on YouTube and build that up and continue my Instagram. I also want to take a little bit of care of what I put up rather than just chucking out a picture here and there. My blog is in the process of being redesigned so I will be launching that in a few weeks. For me, I think it has been leaving that sales job and then being unemployed. At that time I think I had about 40,000 followers and my brand wasn’t fully established and it was scary and it was a case of having to make it work or finding another job. I obviously tried to find another job but that didn’t work so I had to make social media work for me. Even staying positive every day and banking on money on a deal that falls through is scary and a challenge. Just go for it since you only have one life. Stop caring about what others think and go for your dreams. Do not care about what anyone thinks about you, like anyone that I was probably worried about judging me back then I don’t even know their names now. Definitely time. When I left Uni I wanted to focus on my career so I didn’t go out every weekend instead, I focused on what I wanted to do in the future. Sometimes you have to be selfish with your time. In the last five years, what have you become better at saying no to (distractions, invitations, etc.)? What new realizations and approaches helped? I used to always say yes to everything. Then I would be constantly complaining because I didn’t want to do everything and I was really bad at cancelling on people. About a year and a half ago, my boyfriend said to me, the day that you learn to say no is the day you’ll become a happier person. Since then it has just stuck with me and from that day on I just said no to anything I didn’t want to do. Also, people don’t really care if you say no, so just do what you want to do. Honestly, put my pyjamas on and sit on the sofa and have a day off, which I know a lot of people can’t do as they have to go into the office and have their own commitments. But if I can, I will literally chill out because I think if you push it then you are not going to create content that you like. Then I will make a plan that night and get an early night and start fresh in the morning. Don’t beat yourself up for having a bad day because everyone has bad days. You should just accept it and embrace and move forward. I bought this 5-minute happiness journal which I think will be really good. It is a gratitude journal and is good because you write in it before bed and when you wake up. I think it is a nice way to start and end the day instead of looking at your phone. Your boyfriend is also an entrepreneur do you think he has had a big impact on your life in that aspect? 100% absolutely. I don’t know if I would be doing what I am doing if I didn’t have him. He is a huge inspiration to me and also things like tax, which I have no idea on, he knows it all so he can teach me in that sense, so he has been a huge help. What gives you real unadulterated happiness? Being content and when I look back at my life and what I have achieved. I go to bed very early about 10 pm and get up at about 7 am. Then I will have a green tea or a coffee, shower and get ready and by 9 am I will be sat at my desk doing some work, filming a video or writing a blog post. The Secret by Rhonda Byrne. It is a self-help book and is basically about the power of your thought and any thought that comes into your head is going to either positively or negatively affect your life.